Donkey botflies are parasites often found in horses and donkeys of all age's (more than 80% of equids are touched). When they are adults, they are like small flies brown in color and hairy aspect measuring approximately 2cm. Pendant la saison chaude, ces mouches viennent pondre sur le pelage des ânes, et en particulier sur During the summer, these flies come to lay on the donkeys fur, and in particular on the forelimbs, and around the mouth. These flies are noisy in flight which frighten equids, and are often the cause for the donkey to go at full gallop. These eggs are easily identifiable and have the form of small yellow spot stuck on the top of the hairs in great number. 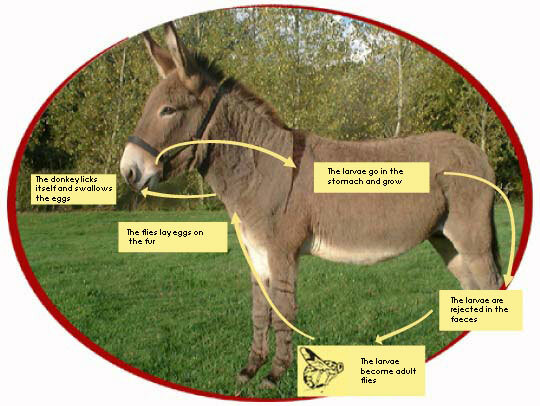 The donkey swallows the eggs which hatch in the oral cavity and transform into red larvae, type of "maggot". For a particular species of gasterophiles, larvae hatch directly on the fur and a right through the cheeks of the animal and cause cutaneous signs. Then the larvae move into the mouth and the tongue via tunnels often at the origin of abscess. They migrate into the throat, until the pharynx and go into the stomach where they are fixed and grow. Sometimes, there can be several hundred. At the beginning of spring, these larvae detach and are rejected in the faeces where they are easy to identify. Then, they are transformed into adult flies who will come in their turn to lay on the donkeys. The symptoms often seen when they are in great number, are ulcerations of the stomach or oesophagus, which cause digestive disorders. We also note the animal can lose weight, delay in the growth or a fall in performance. The larvae reach their maximum development about October-November. This period is thus the most favorable for worming.